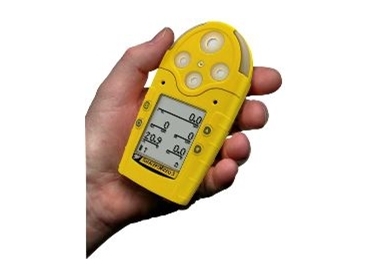 The GasAlertMicro5 PID gas detector. MAKER of a full line of gas detection equipment, BW Technologies will showcase a new user-friendly portable five-gas detector at Safety In Action and Materials & Manual Handling 2005 from 21-23 March. Adding to BW's range of personal, portable, fixed and stand-alone systems, the new GasAlertMicro5 PID is compact and convenient. The unit continuously and simultaneously detects up to five odourless and invisible gases, including toxic volatile organic compound (VOC) vapours, through a photo-ionisation sensor. Other typical applications include the detection of oxygen enrichment or deficiency, combustible gases and a variety of toxins. Housed in a concussion proof, water resistant boot, the GasAlertMicro5 PID is as durable as it is cost effective. Complementing the GasAlertMicro is the new MicroDock II, an affordable automatic calibration and testing system that is also compatible with the GasAlert Extreme and the GasAlertClip Extreme. The MicroDock II is fully portable and easily expandable, with results stored for easy retrieval through on-site or offsite (LAN capable) connections. BW Technologies will be at stand G48 at Safety In Action and Materials & Manual Handling, which runs from Monday 21 to Wednesday 23 March 2005 at the Melbourne Exhibition Centre.